UNICEF reported that one child dies every ten minutes in Yemen with 462,000 suffering from severe acute malnutrition which is a dramatic increase of about 200 percent since Saudi Arabia’s invasion started in 2015. In 2016, UNHCR stated there has been 2.4 million displaced and that number has risen to 3.1 million due to heavy fighting in civilian populations. Yemenis civilians are fleeing across the Bab-el-Mandeb strait from Yemen to neighboring countries like Djibouti to seek refuge. Refugees are also fleeing to Somalia and Oman these countries report thousands seeking asylum. Oman reported nearly 3,000 refugees of 48 different nationalities have fled the conflict for Oman. This conflict, legacy media like to call a “civil war” has killed more than 10,000 civilians and wounded over 40,000 others. It is a “war” that has left 22.2 million Yemenis requiring humanitarian assistance resulting in more than 80% of the population being in dire need. The US-Saudi led Coalition’s haphazard bombardment of one of the poorest nations in the world with little regard for civilian life has also led the loss of more than 50% of Yemen’s “night time electricity” which is key to maintaining hospitals, water supply systems and communications. Not only is the US-Saudi led Coalition bombarding Yemen with no regard, they are actively prohibiting the Yemenis from treating injured civilians. All of these actions carried out by the US-Saudi led Coalition shouldn’t be interpreted as anything less than siege warfare. Not only is siege warfare a violation of international law, but the daily loss of civilian life at the hands of this Coalition is a war crime. The international community needs to decide where they stand on this war and stop turning a blind when over 40 children are killed by a Saudi warplane using a laser-guided, precision-strike half-ton bomb made by the U.S. based company Lockheed Martin. This reprehensible act carried out by the Government of Saudi Arabia will be investigated by none other than the Kingdom of Saudi Arabia themselves. It’s abhorrent and it spits in the face of international laws established long ago to prevent pure devastation to civilian populations like we are seeing in Yemen today. 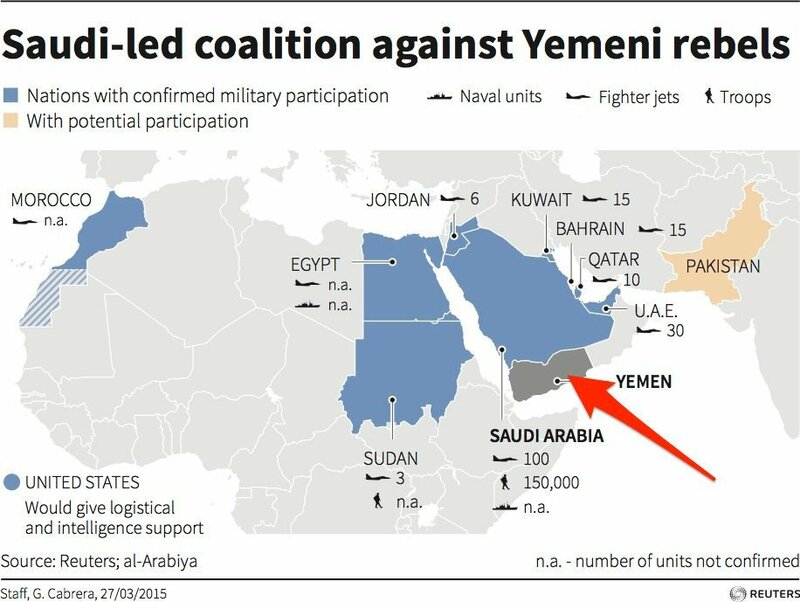 You don’t have to search far for a motive in this war and in my opinion, it has very little to do with the Houthi Rebels, all you have to do to find a motive for this war is take look at Yemen on a map. I implore anyone searching for more information on these atrocities being carried out on a daily basis in Yemen to read Human Rights Watch’s full report. Joziah Thayer is a researcher with the Pursuance Project. He founded WEDA in 2014 to combat mainstream media narratives. He is also an antiwar activist and the online organizer behind #OpYemen. This article was originally published on his website and is reprinted with permission. This statistic is fake. Some guy from UNICEF made it up from thin air (using NO STATISTICS from ON ground). The Yemeni health ministry and media didn’t report it. However the Saudi-led Zionist backed coalition’s war is wrong. And they aren’t winning BTW! Next Next post: Russian Plane Shot Down Near Syria – Who’s At Fault?